Gone are the bakers with their trays like always. No longer is it the same old bread and rolls they sell! Brisbane’s French cuisine scene has gone from strength to strength in recent years, and the arrival of 2019’s French Film Festival gives us the perfect excuse to go ‘research’ (and by research, we mean devour) all the best croissants and traditional ratatouille this city has to offer. So, before you settle in to watch The Trouble With You or Voyez Comme on Danse, enjoy a Parisian foodie rendezvous at any one of the French eats below. We don’t mean to flake, but we can’t help but drop everything just to get our hands on the crumbly goodness that is the pastries, baguettes, and brioche on offer at King Street Bakery. This newcomer to the bakery scene is on a roll, and their divine tarte Tropezienne cannot be croissant. For those after a heartier meal, you can’t go past Montrachet next door for a refined French brasserie vibe. Not convinced that French is the language of love? Your tongue will be saying differently once it tastes the wine at La Cache à Vín. Its tucked away location in a restored cellar makes it the perfect place to pour a glass to pair with creamy Roquefort brulée or pressed duck confit with roasted pumpkin, chestnut, and orange sauce. Named after the moon because you’d be loony if you didn’t visit, La Lune Wine Co is a must-go for every wine aficionado and pinot noir lover. Its wine list alone speaks for itself! Chardonnay, Burgundy, gamay… and can you get any more French than Champagne? Combine with one of their decadent cheese boards or freshly-shucked oysters, and you have the recipe behind a perfect night. ‘Let them eat cake!’ they cried, and little French bakery Chouquette is more than happy to oblige. Besides serving up some of the most authentic gateaux Brisbane has on offer, they also specialise in hand-made almond croissants, choc brioche, sweet breads, and more! A delectable fromage selection or extravagant high tea? To delve into a quiche or go sweet with French toast? While the sheer number of French treats on offer can be overwhelming to choose from, at Belle, it’s impossible to macaron choice – everything is delicious! However, if you’re really struggling, we suggest their delightful wild mushroom tartlet with goat’s cheese and watercress. If the honorary title ‘belle of the dinner bowl’ existed (we think it should), then their onion soup with beer, house-made duck sausage, croutons, and gruyère cheese at Lutèce Bistro would win hands down. 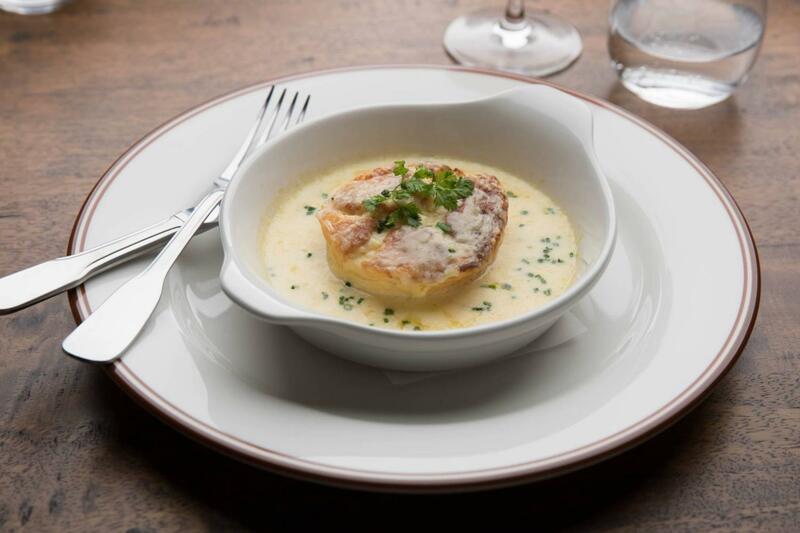 And thanks to Alsace-style cooking, their signature king prawn bouillabaisse made with market fish, scallops ‘cocotte,’ and grilled baguette is also a winning dish. C’est Bon is good (literally). Buy hey, don’t just take our word for it! Try for yourself their delicious le poulet, a slow-roasted chicken Provençal with bell pepper, kale, bush tomato ratatouille, and buttered desiree potatoes dressed in pink pepper sauce. Just imagine it, paired with a gorgeous champagne from Reims, and a soufflé for dessert! C’est la vie, mon cheri. The French Film Festival is in Brisbane from 14 March – 14 April. Find out more here.